By Michelle Malkin • After getting lucrative contract with Fox News. 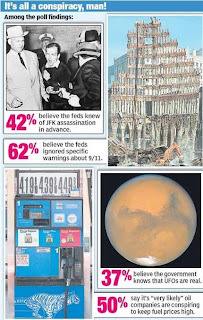 The poll found that more than one out of three Americans believe Washington is concealing the truth about UFOs and the Kennedy assassination – and most everyone is sure the rise in gas prices is one vast oil-industry conspiracy. Sixty-two percent of those polled thought it was “very likely” or “somewhat likely” that federal officials turned a blind eye to specific warnings of the 2001 attacks on the World Trade Center and Pentagon. Only 30 percent said the 9/11 theory was “not likely,” according to the Scripps Howard/Ohio University poll. In that poll, 16 percent said the Twin Towers might have collapsed because of secretly planted explosives – not hijacked passenger jets flown into them. Michelle Malkin prior to Fox Contract and 6 months after the attack on 9/11. Who murdered Katherine Smith, and why? Smith was the Tennessee state license examiner who had been implicated last month in a phony ID scam involving a group of shady Middle Eastern men from New York City. Investigators say there are "connections" between the ring and the Sept. 11 terrorists; one of them had a repair pass in his possession that gave him access to the lower levels of the World Trade Center basement. It was dated Sept. 5. A day before Smith was to appear in court over the matter, she died in a bizarre and fiery crash inside a car registered to one of her Middle Eastern co-defendants. Smith was burned beyond recognition; her arms and legs disintegrated in the flames. Yet, her car was traveling barely over 20 mph when it hit a utility pole and damage to the vehicle was minimal. This week, the Tennessee Highway Patrol concluded definitively that her "death was not the result of the crash itself. Her death was by other means." Is this the vengeful work of al Qaeda killers still on the loose? So where the he-l is Osama bin Laden, anyway? Funny how a large media contract can answer these still unanswered questions and turn everyone still asking them into a tinfoil hat wearer.